Home » Special Coverage » Sales & Promotions » AD: The most anticipated event by Auto Bavaria will be in Penang this weekend – 12 to 14 April 2019! The most anticipated event by Auto Bavaria will be happening in Penang this weekend! Make your way to Juru Auto City as fantastic deals on a wide range of BMW, MINI and Motorrad models are being offered by Auto Bavaria this weekend as part of its Mega Fair campaign. Enjoy attractive rebates on a wide selection of BMW models and financing rates as low as 0.88% per annum* from BMW Financial Services. All new BMW models come with a five-year, unlimited mileage warranty, free scheduled service** and a two-year tyre warranty* for your complete peace of mind. There’s no better time than now to drive home your dream BMW. As for two wheels lover, here’s your chance to ‘Make Life A Ride’ with BMW Motorrad. Come and check out a wide range of BMW motorcycles on display. You will also receive a complimentary gift upon your purchase of a new BMW motorcycle alongside other special offers on BMW Motorrad Style collection and accessories. On top of that, enjoy attractive savings on MINI models with the new MINI Connected installed for next-level connectivity. MINI Connected brings a world of information and entertainment to your MINI with a wide range of intelligent services and apps. Enjoy the convenience of interacting with your car as well as scheduling options when you are inside or outside of your MINI. With the addition of MINI Connected, there’s no better time than now to get yourself a MINI especially when there are exclusive deals waiting for you at the event this weekend. Also, every MINI comes with MINI Black Card owner privileges, the standard MINI four-year unlimited mileage warranty and free scheduled service. 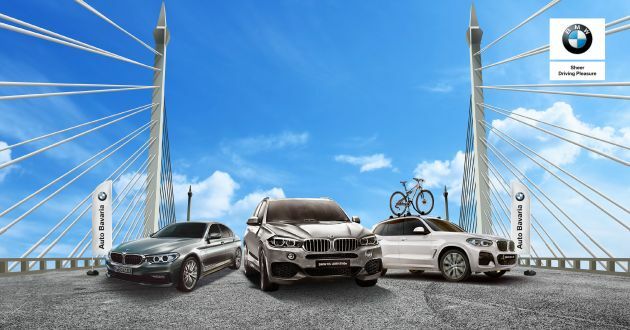 All these and more at the Auto Bavaria Mega Fair, happening from 12 to 14 April 2019, 9:00 am to 9:00 pm at the Juru Auto City Penang and the special offers are also available at all Auto Bavaria showrooms. For more information, visit the official Auto Bavaria Facebook page. **Free scheduled service is provided in accordance with the Condition Based Service (CBS) system in your BMW vehicle.